I’ve long been looking for a way to incorporate an informational section into my website, but until recently I wasn’t sure about how to approach the task. My primary objective when designing the various iterations of my website has always been to focus on the presentation of my photography. After all, it’s what I do, and what can speak more about my art than the art itself? So I’ve spent quite a bit of time thinking about what to show and how to present it as simply as possible without distraction. And in that respect I think I’ve succeeded – at least until I figure out a better way. But there have been times when I have wanted to share more than just a portfolio of my work – perhaps to share the areas of photography that interest me, yet fall outside of the categories that define my professional life. Sometimes I’ve wanted to record the particulars about a shoot – as a tool for future reference or even as a guide for other photographers. Maybe I could share Photoshop tips and techniques and have discussion areas for the exchange of ideas. I’ve had a lot of thoughts about the things I’d like to present, but few conclusions about how to work them into my website without disrupting the existing presentation. It was obvious that whatever solution I chose, it would have to be able to suit multiple, fairly specific needs. After looking at several solutions – from writing pages from scratch in HTML to using full-blown content management systems – I decided to put WordPress to the test. A free and painless installation of WordPress, as well as a couple of other blogging and content management tools, is available as a standard service of LunarPages, my hosting service, so I didn’t have to invest anything in this project other than my time. I installed WordPress software script, then went to work on seeing what I could do with it. Note: There is also a service called WordPress.com which lets you get started with a new and free WordPress-based blog in seconds, but varies in several ways and is less flexible than the WordPress you download and install yourself. During this discussion, unless otherwise stated, I’ll be referring to WordPress, the publishing platform, as it exists on WordPress.org. Everything in WordPress is done from your Dashboard. This is where you create or modify posts and pages, upload and manage media such as pictures, video, and audio, manage comments left by visitors to your site, change and customize visual elements, work with plugins, perform administrative tasks, and more. Make changes from within the Dashboard, update or publish your content, and the changes are immediately in effect on the website. Draft mode is also available for page and post content, allowing you to work with unfinished content before making it visible to the public. 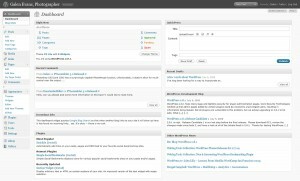 How the blog looks is defined by themes – templates that dictate how a blog will look and feel. Through the use of themes, the look of a website or blog can change dramatically, though the actual content remains exactly the same. It’s kind of like changing clothes – only much easier. Want to see how your site will look using a particular theme? A preview is available of all installed themes, so you can see what the site will look like without actually “activating” the theme, or making it active for the public. Finding, downloading and installing new themes couldn’t be easier and can all be done entirely from the Dashboard. I decided that my first step – after installing WordPress – should be to settle on a theme that could act as a framework for my WordPress installation. There are over 800 open-source themes available on WordPress.org, as well as countless commercial themes, and it took some time to find a handful that I liked. They key was to concentrate on finding layouts that I liked – regardless of the color schemes. I figured that if it was as customizable as I hoped, colors and fonts would be much easier to modify than the layout. As it has turned out, I’ve also managed to learn something about making modifications to the layout in the process, so I’ve been able to customize even more than I had originally hoped or expected. Next, I had to add some content to get a true feel for how things worked and how the site would look. I used an online Latin text generator to create text for a few posts and pages and I uploaded images to see how the process worked. Then, I played around with the different themes that I had installed, discarding a few when I saw how they behaved with content and uploading others for review. From the Dashboard I was able to modify the style sheet of each theme, thereby changing the colors and other characteristics of each. Finally, I settled on a theme called “f8 Lite” and went to work on seeing just how close I could get it look like the rest of my website. 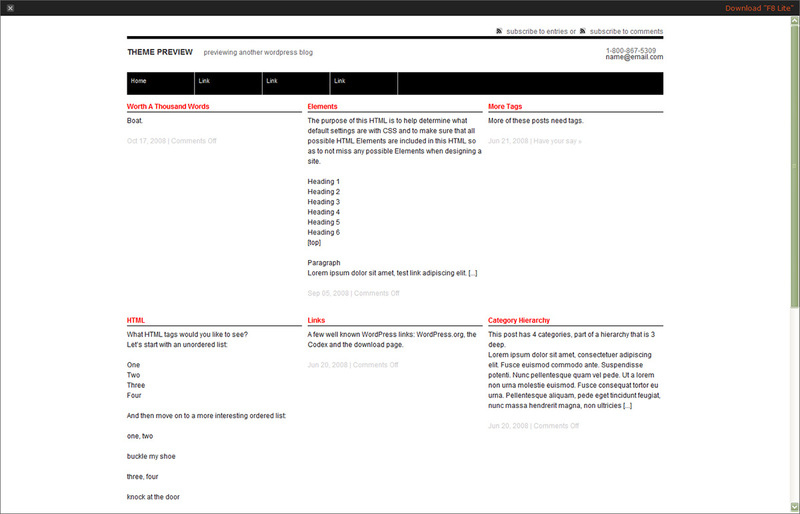 Using the Dashboard style sheet editor, I changed one element at a time, previewing each change as I went. Soon I was able to determine that this theme would in fact suit my needs and I experimented with additional content as I continued to make changes to the look of the theme. In several instances, it was clear that I might not be able to get the look I wanted simply by modifying the style sheet, so I began to try to edit the pages elements themselves. This was a bit harder because the page elements are all PHP based – rather than straight HTML code – and the pieces are in separate files, but for the most part I’ve been able to make all of the changes that I wanted to make. Now that I’ve been working with WordPress for a while, I’ve learned how to use plugins to incorporate slide shows and galleries and have even been able to set up an Online Shop – something that I’ve been wanting to do, but for which I had previously lacked the tools, knowledge, or confidence to implement. Open-source plugins are available for almost any task one can imagine and have the potential, if used properly, to add tremendous functionality – and perhaps even entertainment – to a site. Documentation can be minimal, depending on the author of the plugin or theme, and I’ve figured out that it’s often best to steer clear of those, as well as to look for extensions with positive user ratings. 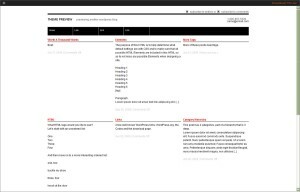 WordPress, however, has excellent in-depth documentation online for the main script. For anyone interested in integrating a blogging tool into an existing site or simply starting a new blog, I highly recommend looking into WordPress.org. It can be as simple or as complicated as you want it to be, but the nice thing is: With the tools the WordPress community has created and made available to the public for free, it’s entirely up to you. This article was posted in Computers & Software, Wordpress and tagged blog, computer, news, portfolio, website, WordPress. Previous Previous post: Nikkor-P 1200mm on a Canon EOS 5D: Are you kidding me? Next Next post: Thinking of becoming a model?